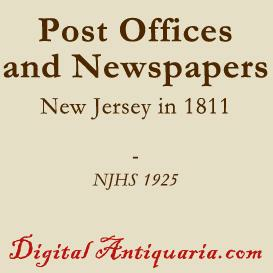 Buy and Download > Description Within the five hundred and sixty-six pages of this volume the attentive reader will find a vast amount of information concerning conditionssocial, economical, religious and politicalin New Jersey in the years 1768 and 1769. The newspapers of the day, though still innocent of any expression of opinion by the printers-editors and editorials being as yet unknown even, in American journalismbecame more than ever the vehicles of public sentiment, expressed in communications from "A True Patriot," "Independent Freeholder," "Taxpayer," and their confreres of the ready pen, eager to discuss at intolerable length the great questions filling men''''''''s thoughts. 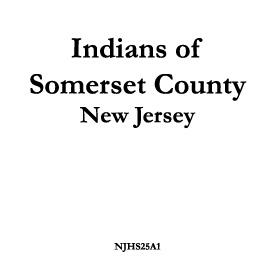 It will be observed that most of these letters relate to economic subjects, indicating that they were the principal causes of discontent among the Colonists. New Jersey was growing fast. Trade and commerce were seeking new outlets. New stage routes were being established, there being two between New York and Philadelphia much of the time, a stage setting out daily each way. A new line between Newark and New York considered that the traffic between those places would he accommodated by four trips a week, probably carrying four or five persons at a time. The people had become so used to these vehicles that it was no longer necessary to seek custom by advertising them as "flying machines," as formerly. The increase of travel was naturally followed by a multiplying of taverns, which were evidently of a better quality than formerly. The growth of commerce led Governor Franklin to urge upon the Legislature the importance of better roads. But the growth of the Province caused a demand for more currency; and the lack of it was followed by a rise in the cost of living, and to some extent a falling off in trade. The writers for the newspapers had their several explanations and as diverse remedies to offer. The pessimist ascribes the "hard times" in 1768-9 to the scarcity of money (the experience of most people from the earliest ages even to the present day); to the increased cost of living, greatly swollen from 1755 to 1768; but chiefly to the "expensive diversions and sins of dissipation unknown among us until of late"a remark which has a familiar sound in the year of Grace 1907. 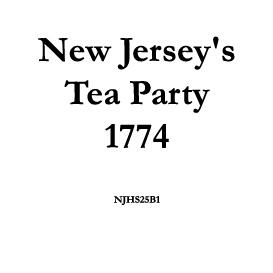 This writer estimates that the people of New Jersey actually expended as much as £40,000, or say $100,000, annually in tea, obviously a waste of good money for a needless luxury. The decay of trade, he somewhat inconsistently assumes, was due to the same cause. Others, however, lay the grievances the people were supposed to have groaned under for some years past to the oppression of the lawyers, who were "rioting in luxury," having "acquired estates from the toil and labor of the necessitous." The remedy, then, was to reduce the fees of the legal fraternity, and to increase the jurisdiction of the justices of the peace in actions of debt, from £6 to £10, or from $15 to $25. So easily, it was thought, could the rich be made poorer, and the poor richer, by a simple act of the Legislature.